The Future We Need is a delightful, practical and thoughtful examination of the tools and mindsets that can help us to foster a world abiding in agaya and ubuntu. Where the focus of Novasutras is to build a religious community to support the spiritual work of agaya and ubuntu, The Future We Need is one of many secular resources that can inform what we do and how we do it. 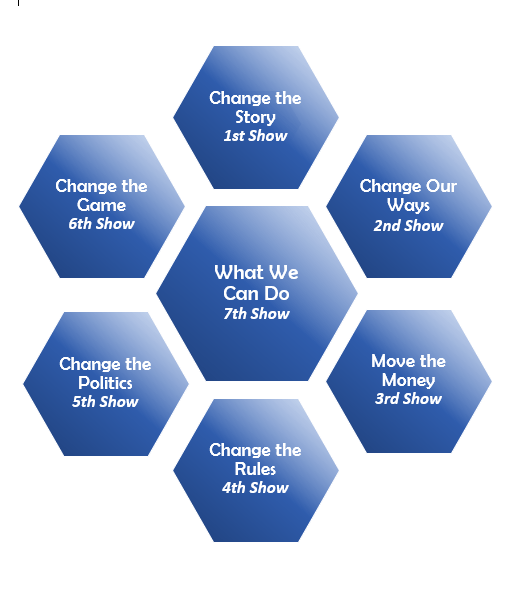 In The Future We Need, host Dr. Nancy Glock-Grueneich, examines how we can Change the Story, Change Our Ways, Move the Money, Change the Rules, Change the Politics and Change the Game in a conversational and engaging series of well-researched videos. Video clips and stories provide illustrative examples of actions from around the world, whether at the scale of living room conversations, to Community Choice Energy, to global movements for divestment, free online education, participatory budgeting or wise democracy. These online videos can be a wonderful catalyst for conversations about what you can do as a change agent for agaya and ubuntu (even if they don’t yet include that language). Local Strategic Action Circles meet in Dayton, Ohio and Santa Cruz, California on June 13th for the closing discussions of the 2018 series. If you’re elsewhere, invite some friends to watch the videos with you. A Citizen Action Field Manual provides outlines, discussion questions and additional resources to support your learning, conversations and activism. With these tools, you can begin to cultivate an active Novasutras community of change agents around many of these ideas and strategies. The future the world needs abides in agaya and ubuntu, and The Future We Need video series is a tool that can help us cultivate it.